Join a free live webinar to find out more about Catch Up® Literacy and Catch Up® Numeracy, structured one-to-one interventions proven to significantly improve the achievement of learners who find literacy or numeracy difficult. We offer a free introductory information session as a webinar so you can join from your computer wherever you are. Watch our 60-minute webinar, designed to give senior managers an overview of the interventions and their implementation and management in your school or setting. 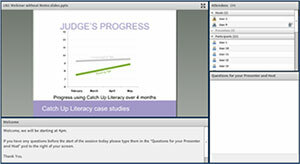 Join Catch Up® trainer Dee Reid telling you about how the interventions work and ask Dee any questions you have. Taking part is easy: we send you a link to login on the day; you watch Dee's presentation and type any questions into the live web chat feature. Dee will stay online for 15 minutes at the end to answer any additional questions. Only one sign up is required per school - multiple members of staff can watch together from one computer. There is no charge and no obligation to book training after the session. Places are limited. Booking closes 2 working days before the webinar.